This notable house was featured in the movie “LA Confidential” as the home of the villianous Pierce Morehouse Patchett. 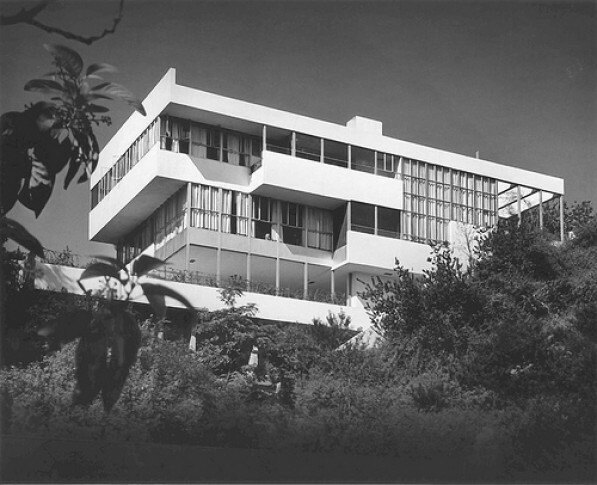 The house was commissioned by Dr. Philip Lovell and designed & built by Richard Neutra between 1927-29. The house is reputed to be the first steel frame home built in the United States. This technolgical innovation allowed for larger expanses of space and glass…allowing for more light and openness than traditional construction methods. Nuetra was interested in cubism, transparency and hygiene. The home is heavily influenced by the International Style of architecture. The Lovell House was added to the list of Registered Historic Places in Los Angeles in 1971. This entry was posted on Wednesday, November 17th, 2010 at 3:19 pm	and is filed under architecture & design, notable homes. You can follow any responses to this entry through the RSS 2.0 feed.